You need to be careful when sharing mutable data across several tasks. If you don’t restrict the access to a shared variable then the tasks will all modify it in an unpredictable way. It’s because you cannot be sure how the tasks will be started and managed by the operating system: it depends on a range of parameters, such as the CPU usage, available memory, etc. If each task is supposed to modify a variable then maybe the first task won’t finish its work before the second task reads the same variable. We expect the final balance to be 5000. Run the code and you will most likely get something less, such as 3856 or 4652. At times you get exactly 5000 but it’s unpredictable. The volatile region of the code is locked using the lock object. The lock is released as soon as the current task has finished working with it. Run the modified code and you should get the correct result. …where TR is the return type of function and Arg(x) is the input parameter type. Note that the return type is the last element of the parameter types. JSON web tokens are a sort of security token. As such, it is used for authentication purposes, and has similar attributes like the XLM-formatted SAML tokens we met in the series on Claims Bases Authentication. It shows the issuer of the token, the claims about the user, it must be signed to make it tamper-proof and it can have an expiration date. If you then log on to a web page then the authentication server will send back a security token that contains the data mentioned above. Upon successful authentication the web site will consume the token. Again, like in the case of the SAML tokens there must be a trust relationship between the consumer and the issuer of the token. This ensures that even the contents of the token are trusted. The consumer knows about the key that the issuer uses to sign the token. That key can be used for validation purposes. At the time of writing this post SAML tokens are the most commonly used security tokens. SAML has quite a complex structure with a strict schema involved. It is very expressive with various encryption and signature options. This last point is actually a limitation in the world of mobile devices. It’s needless to say how widespread mobile devices are in the world. There are probably more tablets and smartphones available nowadays than laptops and stationary computers. It feels like it’s only programmers like me who need computers… Mobile devices must perform their tasks with resources that are limited in comparison to computers. They are not well suited for parsing complex XML tokens. With the fast advance of mobile devices JSON web tokens will soon become – or already have? – the new standard for security tokens. They are already the de facto standard for OAuth2 and OpenID Connect in the modern mobile implementations. If you don’t know what claims are then make sure you understand the basics: start here. These claims can be token specific, such as Issuer, Expiration date, or they can be defined by the application. You as the programmer are free to define what goes into the application-specific claims, such as FirstName, Email, NameOfPet, FavouriteColour, you name it. Type: JWT means of course Json Web Token. Alg shows that the HMACSHA256 algorithm was used to sign the token. "sub": "user identifier such as bobthebuilder"
The list of claims can be extended as you wish, just as we saw in the case of SAML claims based authentication. …where each section is individually base64 encoded. In addition, add a reference to the System.IdentityModel library. There’s a number of ways to exchange JWT tokens between a sender and a receiver. In the below example I’ll use an RSACryptoServiceProvider to sign the JWT so that the receiver can validate it. If you don’t what RSA and asymmetric encryption mean then make sure to read upon it in the blog post mentioned above. In short: the sender, i.e. the issuer of the token will have a pair of asymmetric encryption keys. The public key can be distributed to the receivers. The receiver will use the public key to validate the signature of the JWT token. We won’t build a separate sender and receiver, that’s not the point here, but we want to simulate that the sender has access to both the private and public keys and the receiver only has the public key. In GenerateRsaKeys() we generate an RSA key and save its full set of keys and the public key only in two separate parameters of the RsaKeyGenerationResult object. You’ll recognise the parameters in the JwtSecurityToken constructor. You’ll see that we used the full RSA key to sign the token. The SecurityAlgorithms string enumeration stores the fully qualified names of the signature and digest algorithm. Those are compulsory arguments in the constructor. Run the code up to this point and you should see a long string with the 3 segments mentioned above. If your organisation has a valid X509 certificate then it can be used in place of the RsaSecurityKey object. Check out the X509AsymmetricSecurityKey object which accepts a 509Certificate2 object in its constructor. 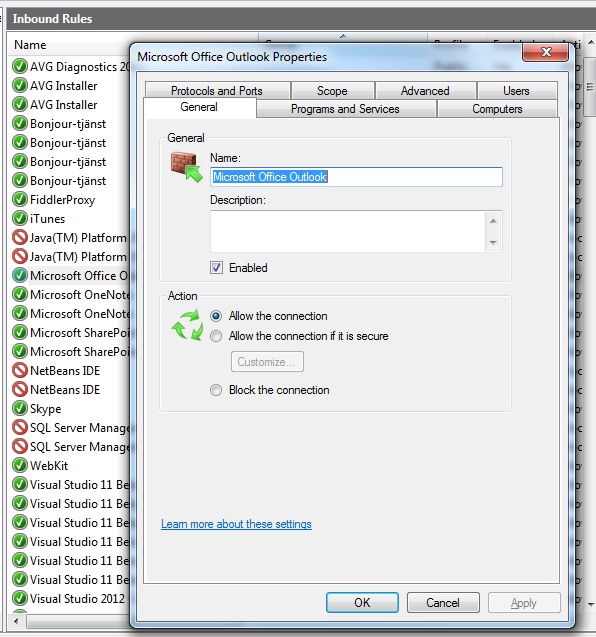 You’ll need to export the certificate with both the private and public keys and save it as a .pfx file. You can do that using the certmgr snap-in in Windows. Use the full file name of the .pfx file in the constructor of the X509Certificate2 constructor. You can transmit the token in a number of different ways: in the header of an HTTP request, in the query string, in a cookie, etc. It’s now a string that you can send to the consumer. The client receives the base64 string which can be used in the constructor of the JwtSecurityToken object. We then use the public-key-only version of the RSACryptoServiceProvider to simulate that the receiver only has access to the public key of the sender. The TokenValidationParameters object can be used to build the validation logic. The JwtSecurityTokenHandler object is then used to validate the token. Upon successful validation you’ll get the ClaimsPrincipal which you’ll recognise from the posts on claims based auth mentioned above. Set a breakpoint after the last line of code and inspect the contents of the claimsPrincipal object by hovering over it in VS. Sometimes you want to get a return value from a Task as opposed to letting it run in the background and forgetting about it. You’ll need to specify the return type as a type parameter to the Task object: a Task of T.
We count to 500 and return the sum. The return value of the Task can be retrieved using the Result property which can be converted to the desired type. We specify that we want to count to 300. Please check out Stefan’s comments on the usage of FromResult in the comments section below the post. This is the last part in the series on basic networking for developers. Let’s look at firewalls first. Check the tabs in that window: you’ll see that you can set different options for the domain, private and public profiles which represent different states of Windows. It’s recommended to have the same settings for all 3 profiles unless you want to have different rules for your enterprise and home network. 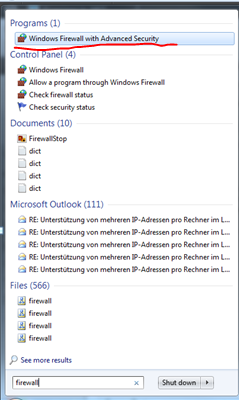 In this window you can turn the firewall on and off where the default is on. By default no dropped or successful connections are logged. If you suspect that your firewall drops data packets coming to your machine then it can be useful to log such events, so change that drop down list to yes. You can also specify the log file on the top of the window. As we said normally you’ll apply the same rules to all profiles. Then in the last step of the process you can provide a name for this rule. Give it some name and click finish. 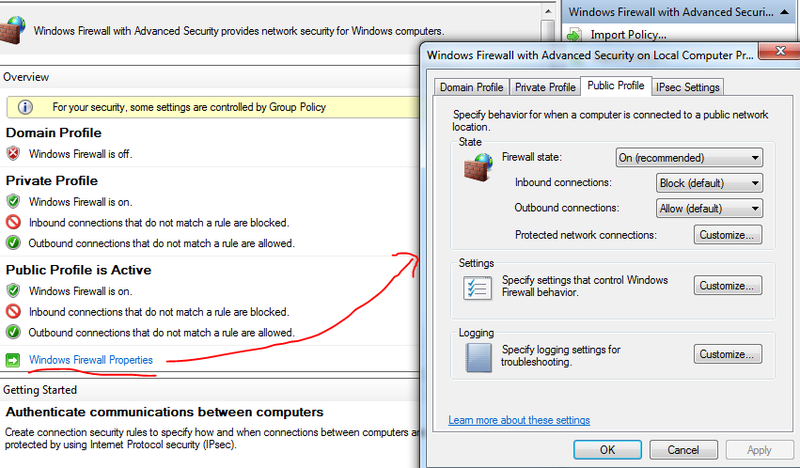 The new rule should appear in the list of rules on the main firewall screen. This way of setting up a rule is useful if you’re not sure which port(s) a process uses. You can instead declare that all ports be opened up that are in use by that application. You can also define which port to open or close: all ports or just one specific or a range of ports. Let’s specify ’80, 443′ in the Specific local ports text box which will allow HTTP(S) traffic. Click Next and this screen will be familiar: you can allow or block the connection. Click Next. 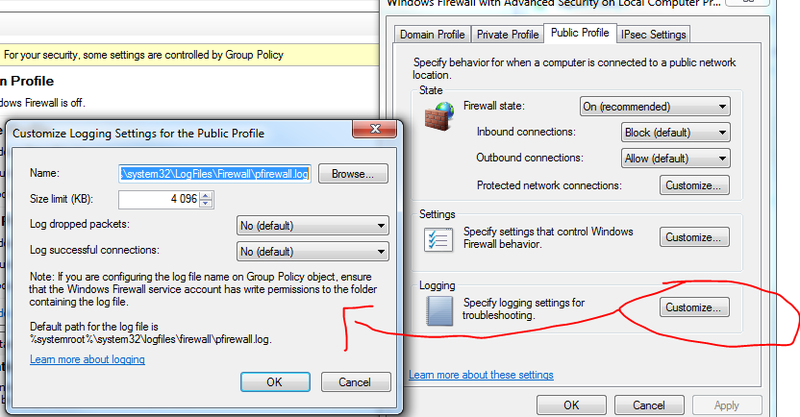 Again, the window will be familiar, you can define in which Windows profiles the rule will apply. In the last screen you can give a name to the rule, just like before. You’ll typically set this rule on your web server. If you don’t open up port 80 on your web server then no-one will be able to access the contents of your number one website. You can add predefined rules by selecting the Predefined radio button in the very first window of the setup process. Open up the drop down list and you’ll see a whole bunch of predefined rules. These rules represent the Windows services that have been installed on your machine. You’ll see an option called Remote Desktop. 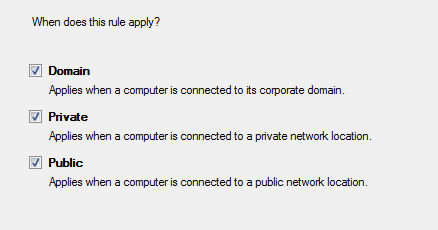 This rule allows others to remotely connect to a computer. Click next and you’ll see some information on which port is going to be opened and some other parameters of the rule. If the predefined option needs more than one rule, such as Routing Volume Management, then all of them will be listed here. 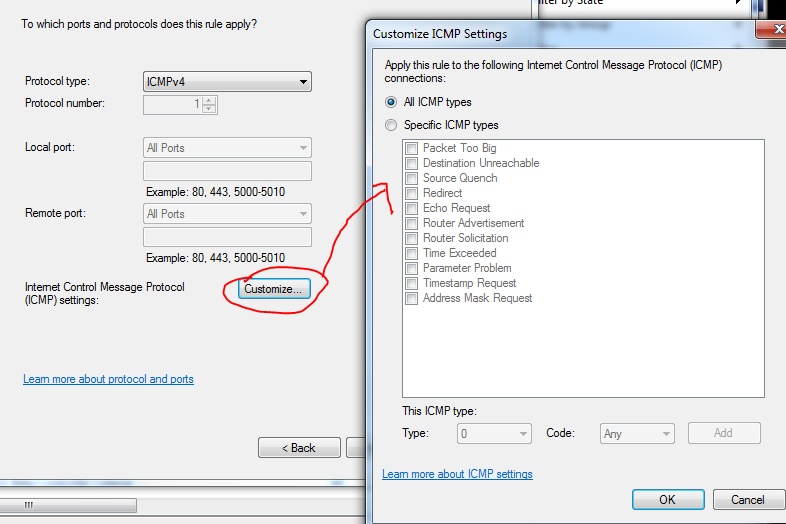 Select All ICMP types and click OK. Click Next to go to the Scope window. Here you can specify which local IP address this rule applies to and where we want to allow the traffic from – this is given in the remote IP section in the bottom half of the window. For now select the Any IP address option for both. The last three stages, i.e. Action, Profile and Name will all be familiar by now. In this window you can specify a couple of options that were not available during the normal setup process. E.g. you can provide the authorised computers under the Computers tab. You can specify the users that are allowed to access this rule under the Users tab. 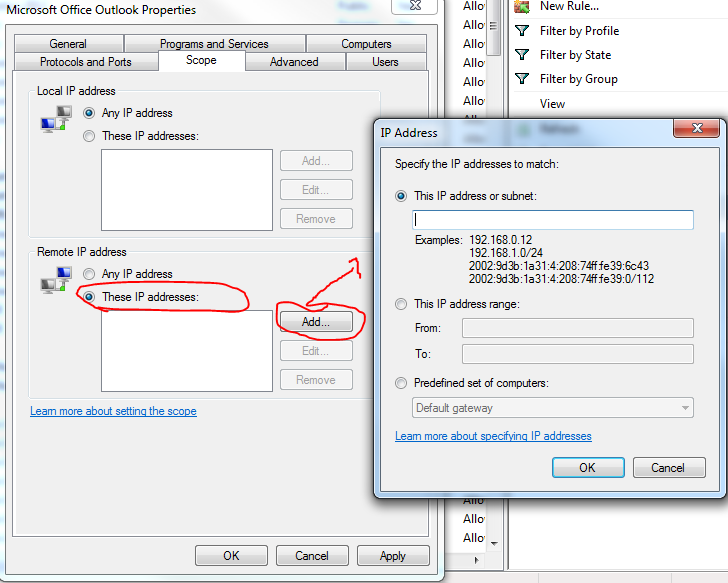 Under the Scope tab you can define the IP addresses as we saw in the case of the Custom rule. As you see you can get to these options for any rule type but it’s offered during the setup phase only in the case of the Custom rule. 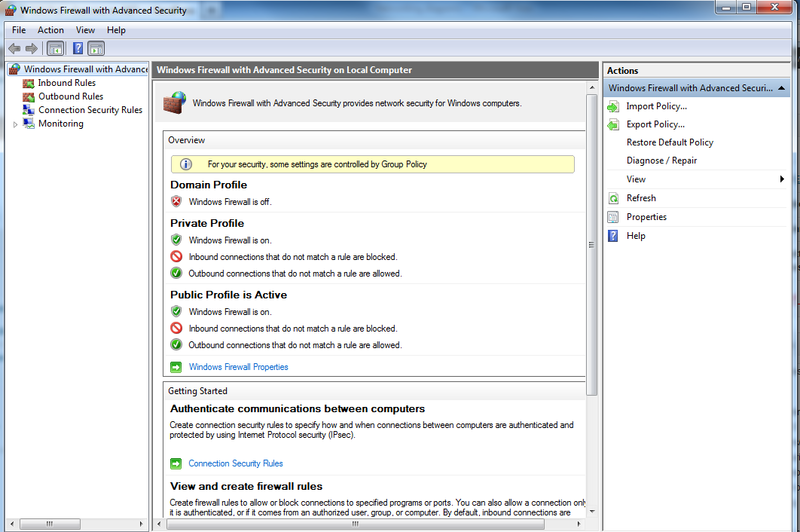 The Scope can be interesting if you want to setup the Remote Desktop predefined rule. You probably don’t want to let any computer get remote access to your computer, right. For any given machine in a network it is most likely enough to let other computers in the same subnet success it. E.g. I can remotely access the web servers that belong to the network of the company I work at. We don’t want anyone else to be able to access those computers. 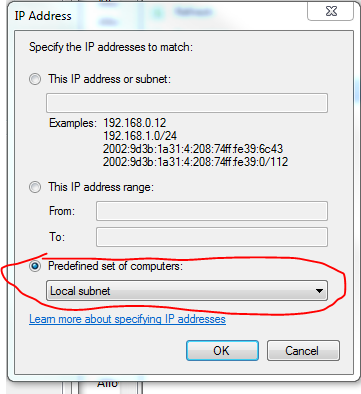 You can allow other subnets as well by clicking the Add button again and filling in the IP ranges. We mentioned in the previous module of this series that with NAT we can have multiple private IPs corresponding to the same external public IP. We also said that we’re running short of public IP addresses so we can look at them as scarce and expensive commodities. Your ISP will probably only give you a single public IP although you can have several machines online in your home: your laptop, tablet, smart phone, your children’s computers etc. They will all have a private IP. Each private IP will be translated to the public IP in the outgoing traffic. Conversely the public IP will be translated to the correct private IP in the incoming traffic. It actually makes sense that not all devices need public IPs. Why would anyone need to access your laptop from the public Internet? The NAT device in the home environment is usually your router. It will translate the sessions back and forth between the internal and external addresses. In case you have a service on your home desktop that you want to make publicly available then the traffic coming to the your public IP will not be routed to the private IP of your desktop unless you set up a specific NAT rule on your routing device. This NAT rule will say that any inbound traffic coming to the external IP address be routed to a specific internal IP address. 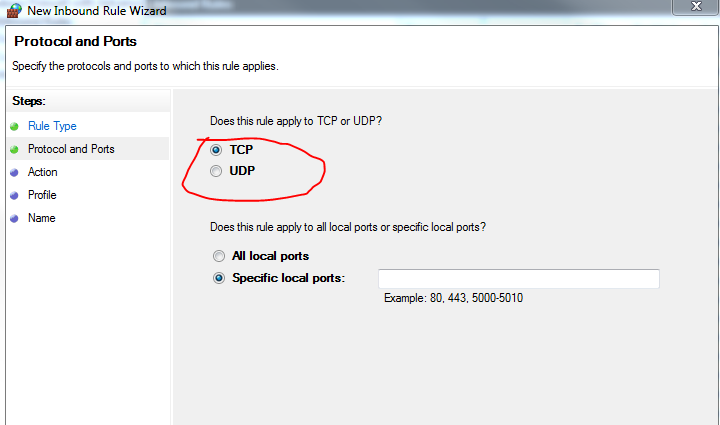 Alternatively you can set up a port rule on the NAT device. The port rule will say that any traffic destined for a specific port be routed to an internal IP address. 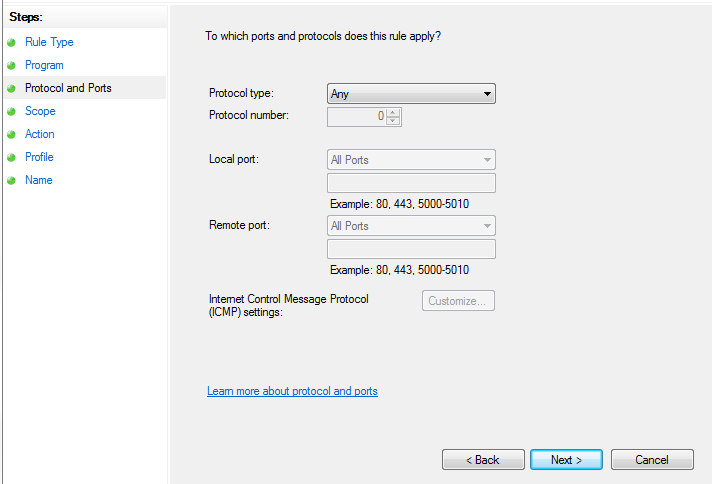 You can set up multiple port rules to direct incoming traffic to the correct private IP. This can be useful if you want to host a website on your home desktop or you want to be able to remotely access a specific computer in your house. The easiest way to find your public IP is use one of the many online IP services such as this or this. This sites will show you which IP address you’re coming from. Concurrent collections in .NET work very much like their single-thread counterparts with the difference that they are thread safe. These collections can be used in scenarios where you need to share a collection between Tasks. They are typed and use a lightweight synchronisation mechanism to ensure that they are safe and fast to use in parallel programming. Concurrent dictionaries are thread-safe equivalent collections of “normal” dictionaries, i.e. key-value pair collections. Concurrent dictionaries are ideal if you would like to share a key-pair collection of types K and V among several tasks. The ‘try’ bit in the method names imply that your code needs to prepare for the event where the element could not be retrieved. If multiple threads retrieve elements from the same collection you cannot be sure what’s in there when a specific thread tries to read from it. E.g. even if ContainsKey returns true there’s no guarantee that the key-value pair is still present when the thread tries to read from it as another thread might have already removed it.